Here we have a really lovely Christmas Postcard image, by artist Ellen Clapsaddle. 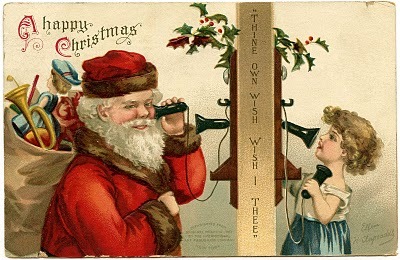 This one shows Santa Claus on the telephone with a little girl. So sweet! How unusual! I love it. Ooooh! This will be perfect for my mom’s friend who worked for the telephone company! Not quite as far back as when they had those phones, but close! 🙂 Thanks much! 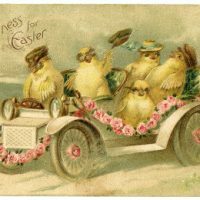 I LOVE this old postcard! It will definitely find it’s way into my holiday decor. Thanks for all that you do to post these awesome graphics for all of us to use. I haven’t commented for awhile but I’m always dropping by for a visit. Love this image, BTW , I just did a Christmas banner with Bo-Bunny paper and I am sure this or a very close facimile is one of the images on it. Thank you for the beautiful pictures. I like to make post cards and send to the family.